Product DetailsYou're killing me, Smalls! 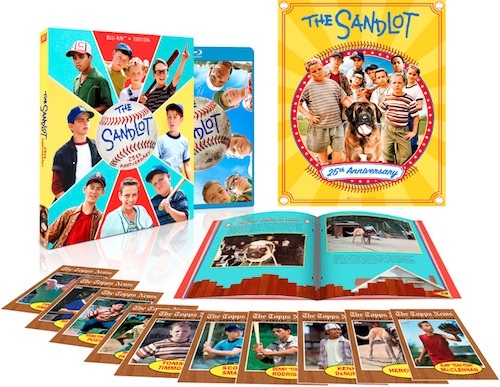 Listen up, Scotty, if you're looking for trading cards from The Sandlot, the 2018 Topps The Sandlot 25th Anniversary Blu-Ray set provides an added incentive to purchase the Collector's Edition Blu-Ray in honor of the movie's initial release in 1993. Titled "The Topps News: The Sandlot All-Star" set, the 2018 Topps The Sandlot 25th Anniversary Blu-Ray cards use the wood-grain design from the 1962 Topps All-Star subset. A total of 10 cards come in each movie set, including the young stars of the diamond and even Hercules (the destroyer of signed Babe Ruth baseballs). However, the exclusive Topps cards are just one part of the special box set which releases March 27, 2018. Fans can also find a full-color poster, a booklet with rare movie photos from the director's personal archive, and a commemorative 25th-anniversary cover for the case. Order The Sandlot 25th Anniversary Collector's Edition Blu-Ray on Amazon. Adding to the excitement, the special movie offering revealed additional cards for The Sandlot in 2018 Topps Archives Baseball in August. Some collectors may remember that the 20th-anniversary edition of the film (in 2013) also included exclusive cards. However, these were not produced by Topps. If you need a little more to remember the movie, Funko makes Pop! The Sandlot figures. 2018 TOPPS ARCHIVES INSERT + SP LOT 7 TBTC + THE SANDLOT + FUTURE STARS !